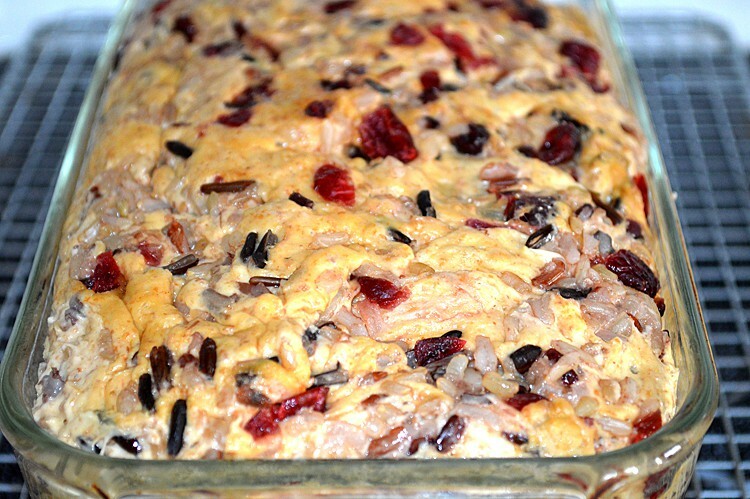 I was searching for recipes that used cranberries (since I purchased about 4 pounds!! 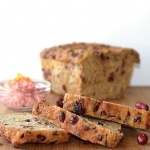 of fresh cranberries when they showed up at my market :), and found a few versions of this unusal – but delicious – Cranberry Wild Rice Bread. And after… See how it kind of went over the edge a bit there? Two reasons this might have happened. My loaf pan might be just slightly smaller than average and sometimes, the dough just rises more than others. However, if you can see the pic above, it’s just too full after rising. Next time, I would take some of the dough and just bake it into muffins. The loaf pan should be no more than 2/3 full. Lesson learned! 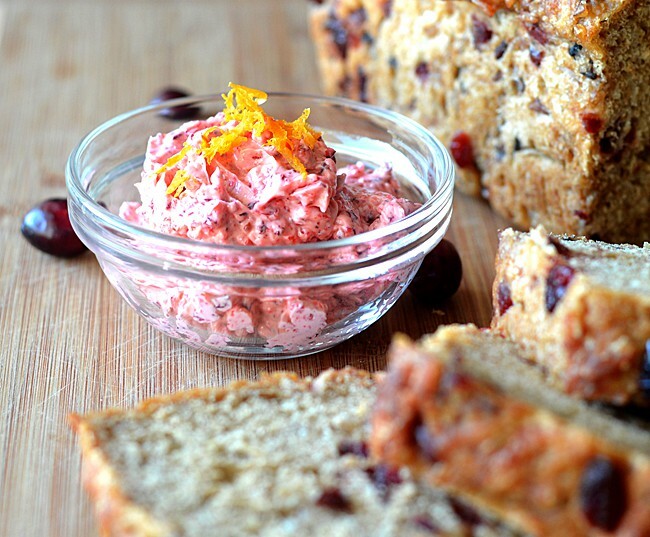 To take this recipe over the top, I also made a cranberry orange butter. 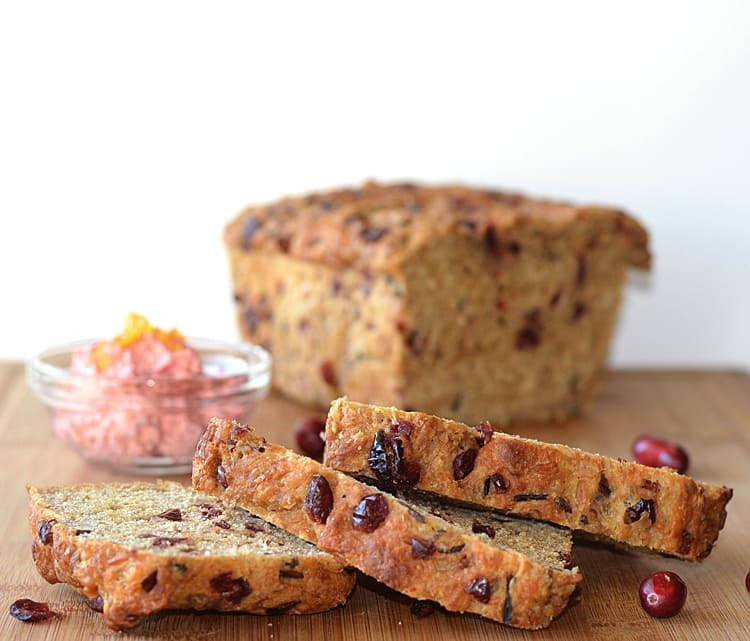 Using vegan margarine (we use Earth Balance) and fresh cranberries, we created this flavorful spread. Also in there, orange juice and zest. A little agave to round out the sweetness. 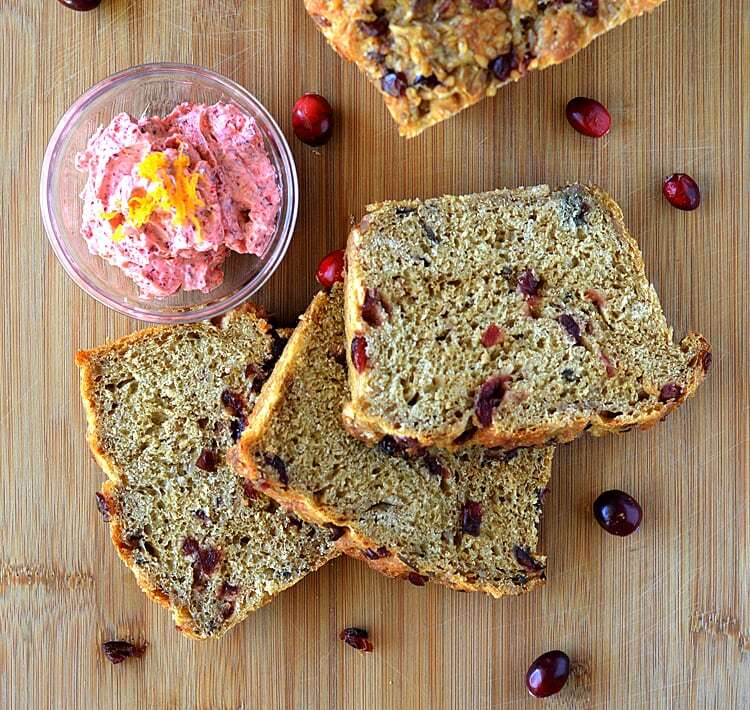 Try this bread as toast and let that cranberry butter just melt over it. 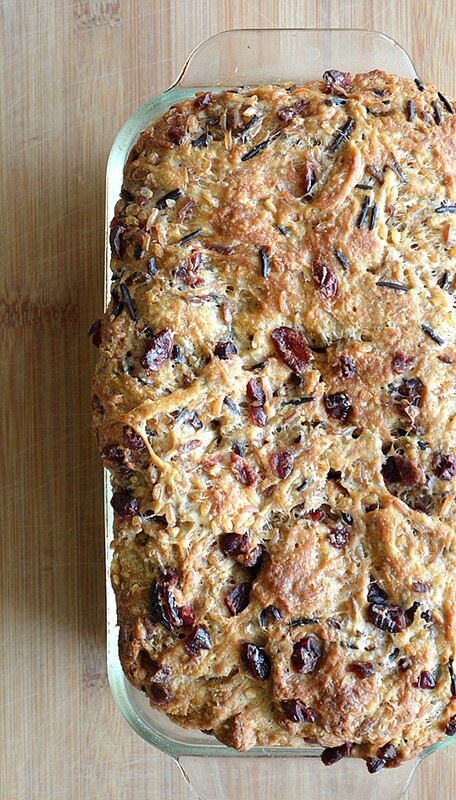 You could also make an amazing french toast or…cut this bread into cubes and make toasty croutons for a delicious fall salad served with a cranberry vinaigrette (recipe coming soon)! To make the bread, whisk together the flours, yeast and salt. Add the water, molasses and olive oil. (NOTE: The butter is for brushing the top after rising and does not go IN the dough). Mix together until everything is incorporated and knead until smooth. This took me about 7 minutes. You could also use a mixer with a dough hook to do this. Knead until everything is incorporated evenly. Lightly spray or oil a bowl and place the dough to rest for 1-1/2 hours. Cover with a lint-free towel (or plastic wrap). Spray a loaf pan with cooking spray. Lightly punch down the dough and place into the loaf pan. Be sure your pan is only filled 2/3 full. I found that I had a slightly smaller than average loaf pan and once risen, it went over the edges a bit. If you have to much dough, you could always make a couple of muffins out of the surplus. Cover the loaf pan and place in a warm area to rise again for 1 hour. Brush with the melted margarine. Bake for 40-50 minutes. Oven temperatures vary greatly, so start with 40 and keep an eye on it. You'll want a skewer or toothpick inserted to come out clean. Allow to cool for 20 minutes in the pan. This is important for it to hold it's shape. Don't let it sit too long or it will begin to soften from the steam. Transfer to a wire rack to cool completely. Wrap in foil and refrigerate if not serving immediately. To make the cranberry butter, place fresh cranberries in the bowl of a food processor and puree. Add the vegan margarine (room temperature blends best). Add the orange juice and zest. Blend to combine. Taste and add agave to desired sweetness. Ooo! Love your idea to use this for French toast! This looks great and love the butter!